Nilambar Babu’s garden house, which housed the Ramakrishna monastery in its early days, is now a part of Belur Math and is known as the Old Math. It is situated about a kilometre southwards from the Belur Math near the Belur boat jetty. Belur Math is the fourth and permanent abode of the Ramakrishna Order, the earlier three being Baranagore Math (1886-1892), Alambazar Math (1892-1898), and the Old Math (1898-1899). The Old Math is associated with sacred memories of all of Sri Ramakrishna’s disciples. Mother stayed here several times and blessed many aspirants with initiation. Swamiji wrote here ‘khandana bhava bandhana’, the arati song sung during vespers in all the centres of the Ramakrishna Math and Ramakrishna Mission, and ‘Om hrim ritam’, the hymn to Sri Ramakrishna chanted after the arati. He also wrote here the hymn on Sri Ramakrishna beginning with ‘Achandala’. He initiated Miss Margaret Noble into brahmacharya here and gave her the name Sister Nivedita. He also gave sannyasa to a number of brahmacharis here. Shrine: The room where Mother stayed during her visit to this place is now maintained as a shrine, located on the north-east corner upstairs. Terrace: Mother used to sit for meditation on the terrace adjoining the shrine. One day while in meditation she said, ‘My mind is merging in red light and blue light. If this state continues, my body will not last. Another day she was so absorbed in meditation that as she emerged from that exalted state, she did not regain her body consciousness and exclaimed, ‘Oh! Where are my hands? Where are my legs?’ Yogin-ma, her lifelong companion, who was nearby, pressed her hands and legs repeatedly, after which Mother regained body-consciousness. Sometime in 1893 Mother performed here panchatapa, ‘the austerity of five fires’, for seven days. It is an austerity performed by sitting in meditation surrounded by five fires—blazing fires from dried cow-dung cakes on four sides, with the burning sun above for the fifth fire. In Mother’s case this austerity had more than one purpose. Once Mother said that she did this for the good of the world. On another occasion she said that the austerity was meant to ward off a spirit that had been following her. The third answer that she gave was that tapas, or austerity, was necessary to achieve anything great, and pointed out that even the Divine Mother Uma had to perform tapas in order to get Shiva as Her husband. The last reason was significant, for only after this austerity did her spiritual ministry and her role as guru begin in a significant way. Bathing Ghat: Mother used to sit on the steps of this ghat and admire the beauty of the Ganga flowing by. It was here on a full-moon night that she had a spiritual revelation of Swamiji’s mission. 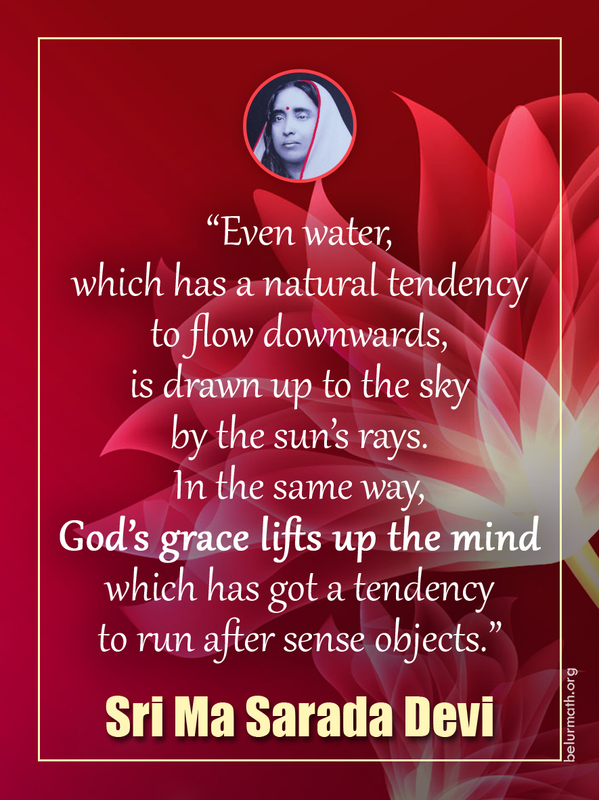 She saw Sri Ramakrishna walking down into the Ganga and his body dissolving in the sacred waters. Swamiji sprinkled that water on innumerable people, chanting loudly, ‘Jai Sri Ramakrishna!’ The vision created so vivid an impression on her mind that for long she hesitated to enter the Ganga, for Sri Ramakrishna had merged into it. Swamiji’s role in spreading Sri Ramakrishna’s universal message was revealed to Mother in this vision. This Math was earlier known as ‘Nilambar Mukherjee’s Garden House’, when it was rented on several occasions for Mother’s stay or for the activities of the Math. Finally, it came under the possession of Belur Math in 1984, and, after extensive restoration, was opened to the public on 12 December 1987, Mother’s birthday.